As the clock ticks closer and closer to 2011, I thought I’d reflect a little on some of the projects that we have worked on this year. I’d love to post a little bit about all of the projects that we worked on in 2010, but for that I would need to publish a book! So, instead I’ll just remind you of a few particularly memorable projects. We printed and sewed so many amazing digitally printed backdrops this year. A few that come to mind include several gorgeous panels for Brooks & Dunn‘s “Last Rodeo” farewell tour (I love the cowgirl images! ), the “Distressed Fleur de Lis” pattern for Little Big Town, Billy Idol in black and white, and, of course, the beautiful backdrop for Kenny Chesney (third year running). All beautiful, all unique! Of course, all of the drapery that we make is custom-made according to the client’s specifications, so all projects are interesting and unique. But some projects really stand out. The Silver Scrim for Yusuf Islam was so beautiful and quite unusual. The Alice in Chains project was so cool that I posted about it twice, and of course the drapery in sheers and silvers for Celtic Woman set the perfect ethereal backdrop to their music. These are the projects in which we really “think outside the box,” using materials and/or techniques that are just a little bit different from the usual drapery style. I loved the Metal Mesh frame pieces that we made for James Taylor and the Korn backdrop was an amazing combination of netting, digital printing, and smoke tubes. And just a few weeks ago – who could forget the American Parachute that we made for Katy Perry? All of these terrific projects are just a small fraction of the projects we worked on in 2010. I can’t wait to see what projects come our way in 2011! Recently, Rent What? and Sew What? were excited to work with Daunte Kenner of DK Show Production & Design to help him bring his set design to life for Mary J. Blige’s U.S. tour. In prior posts, I have mentioned the Starlight LED backdrops. One of the great things about the Starlight LED drapes that Rent What? offers for rental is that they are available in two sizes (15′ x 30′ and 20′ x 20′), but they can be run horizontally or vertically and can be combined to make a much larger backdrop. That was the case in Daunte’s design for the Mary J. Blige tour – a number of Starlight LED drapes were combined to make up nearly 5,000 square feet of “starry, starry night”, covering the entire rear of the stage as well as both sides. Daunte also selected from Rent What? a gorgeous 30′ h x 60′ w Silver Satin Austrian Drape for use as an Act Curtain. Sew What? got into the act by manufacturing a custom “City Skyline” digitally printed scenic backdrop along with additional custom stage drapes. It really was a fun project to work on, and it is exciting to hear that many of these same pieces with be a part of Mary J. Blige’s upcoming international tour dates in 2011! Want to learn more about this project? Click here. Each year, Sew What? and Rent What? 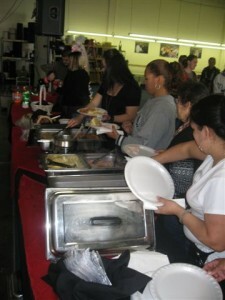 have a joint holiday luncheon and party for all of the staff. It is always a lot of fun – we have a catered traditional holiday meal (turkey, ham, and all the trimmings), silly games (with prizes), and a DJ for dancing and general merriment. It’s a great time for all of the staff – office and shop combined – to spend together. It’s always great to share a meal together for the holidays. 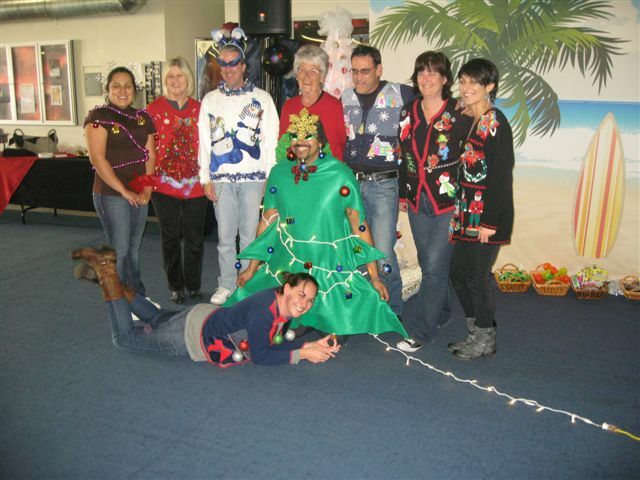 This year, we added an “Ugly Holiday Sweater” contest – it was so much fun to see all the crazy sweaters that people came up with. Rick stretched the “Ugly Sweater” concept a little, but his Christmas Tree Costume (complete with working lights) was incredible! After the meal and a few fun party games (limbo, anyone? ), everyone hits the dance floor to work off some of those holiday calories. Line dancing is always fun! Hope you enjoyed the photos and videos. From all of us here at Sew What?, we wish you a joyous holiday season! You may recall that last December, I posted on the 2009 Sew What? Tee Shirt. 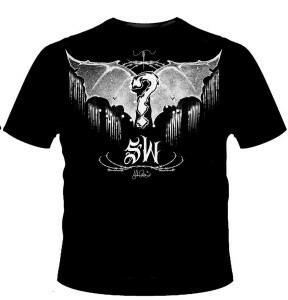 Each year we create a limited edition tee shirt for staff and customers. 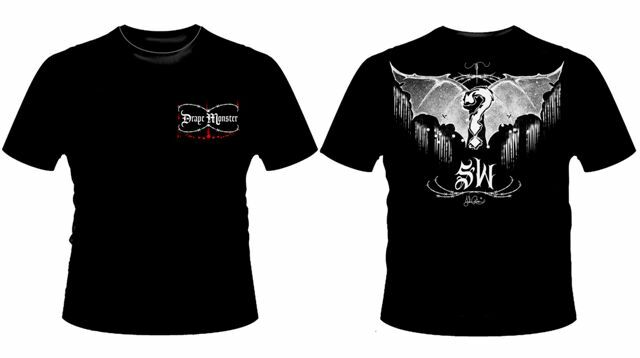 In 2009, it was a really cool “Rock-n-Roll / Metal” design by John Rios of GrafixJam. Well, John did not rest on his laurels – this year he created two awesome designs for us! The first design was again a cool Rock-n-Roll / Metal design, with the “Drape Monster” design on the front and the back design distinguished by two wings surrounding a stylized version of our iconic question mark. Pretty cool, don’t you think? This year, we added a second design to the mix. It is our cool female “Superhero” design (also courtesy of John Rios). We also used this design on mousepads and coffee mugs. I just love this design – it is so quirky and fun. Great job once again, John! Not surprisingly, hiring tends to slow down near the end of the year. Since the list is quite small for November and December, I thought I would combine them in a single post. Congratulations to you both! We are looking forward to another five years (or more) with each of you.